Nocatee will host the 2015 Flavor Run Jacksonville 5K on April 25th! This is the second consecutive year that the community has been selected to host the organization’s Northeast Florida race stop. Flavor Run is a unique 5K phenomenon, similar to the Color In Motion organization, that hosts events nationwide. These fun 5ks attract every style of runner, from the novice jogger to the competitive runner looking to spice up their run. For every race, Flavor Run partners with host cities’ local charities and businesses. This year, Flavor Run will donate event proceeds to Jacksonville non-profit – Easy Peasy Kid's Fitness Foundation. This 5K experience gives runners and walkers the opportunity to transform their wardrobe as they travel throughout the community and its Greenway Nature Trails. Along the 5K course, participants can look forward to “Flavor Stations,” designed to lightly mist runners in “fruit flavored (FDA Approved/All Natural Corn Starch) celebration color powder that has a refreshing taste of delicious fruits.” The Flavor Run promises to “engage all of your senses and make you smile” at Nocatee. The Nocatee Town Center is also the site for the “Post-Run Flavor Zone.” Last year, post-run festivities included complementary fruit, local fitness/health vendors, live-entertainment, and children’s activities. 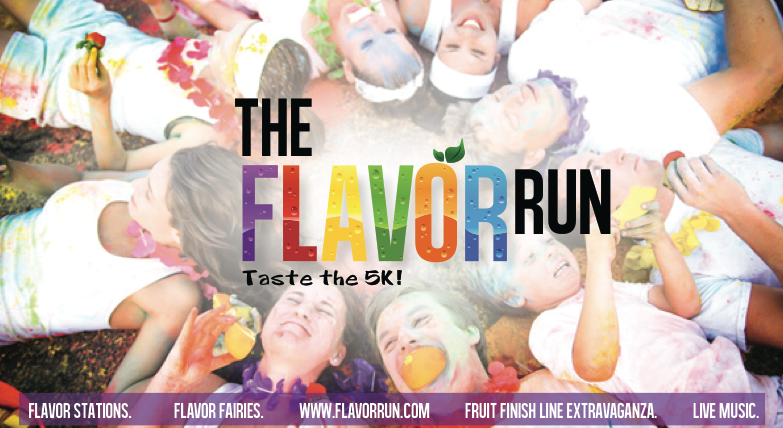 To learn more about the race and to register, visit Flavor Run 5K's official website. For more information on the variety of events and activities that Nocatee families enjoy, stop by the Nocatee Welcome Center or call 1-800-NOCATEE.